Detroit – Brooklyn Street Local – vegan in your city. Friday night JC and I drove down to Detroit this weekend for a quick shopping trip, and a brief getaway from Toronto. Our first stop after a reasonably restful, but also semi-mediocre stay at the Hilton Garden Inn in downtown Detroit was Brooklyn Street Local, a diner-y spot with the V word on the menu, which was a mere 20 minute walk from the hotel. Finally, it was our time for breakfast. I like that there was enough seating space to feel comfortable, and unlike some diner-y spots where it feels like they’ve just put as many tables as possible so everyone is sitting elbow to elbow, there was room to eat and talk without talking in someones ear. 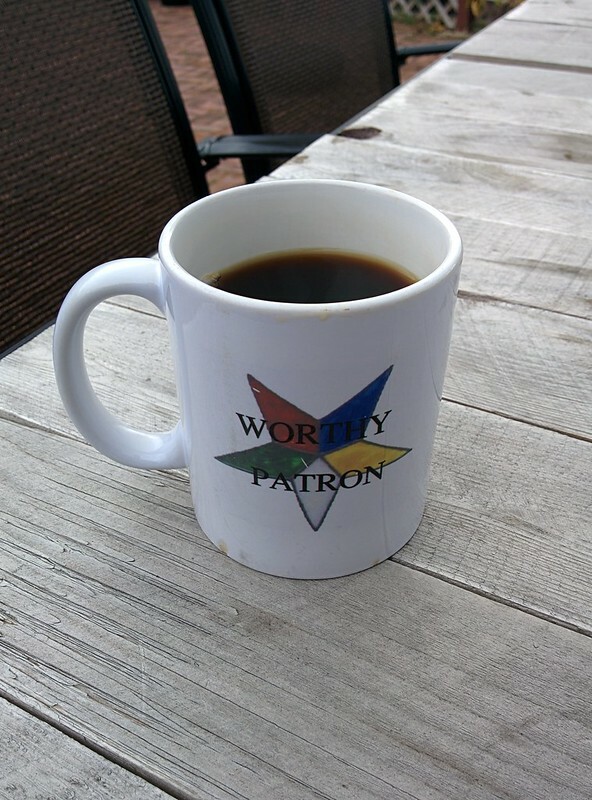 That was an immediate positive feeling, I like my personal space, and I like places that seem to care about whether patrons are reasonably comfortable. Staff were all pretty nice, and I then I noticed the “Brooklyn Street Local Story” on the back of the menu. 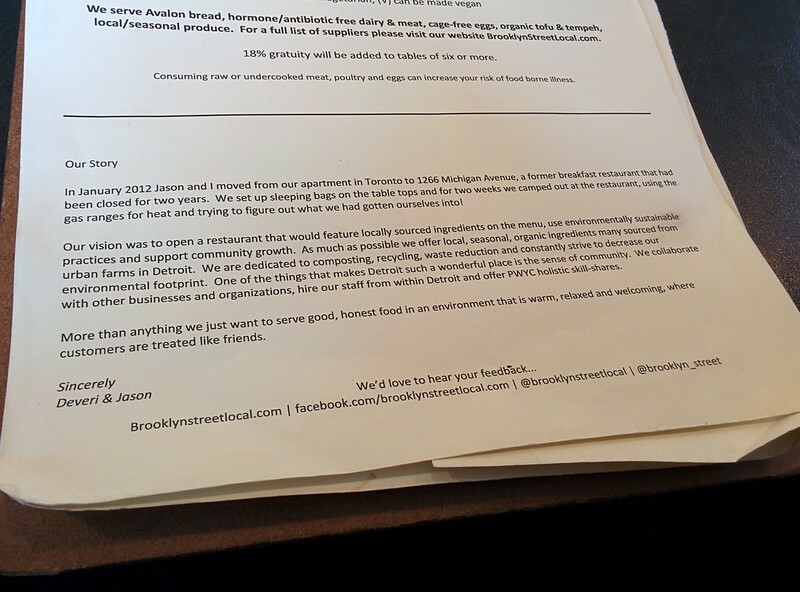 As you can see, the folks behind Brooklyn Street Local are originally from Toronto (Deveri & Jason), and if you want to read a bit more about why they ended up in Detroit, they have a few pages in Detroit Food (which happen to be available free from Google) and there is a video up on Detroit News about their story. Knowing people that started up food businesses in Toronto, I can’t blame these folks for wanting to get out and spread their wings elsewhere. It’s not always easy, and it was cool to pay their place a visit in Detroit. I like their general philosophy, and I appreciate that they try to source as many ingredients and supplies from their local community, especially nearby, but also within their state. As I looked at their suppliers and partners list I tried not to roll my eyes are “happy hogs” and the mention of Eden foods (I’m still a bit miffed about the Eden lawsuit in response to the Affordable Care Act in the USA, & still not purchasing anything from them from stores, and usually avoiding their products altogether) but besides that, I think the BSL crew’s hearts are in the right place, and their angle of supporting local seems pretty consistent. Obviously I love that they are supporting (or at least claiming to support) local urban farms, tempeh makers (The Brinery), coffee roasters, and even a local compostable take-away container company. 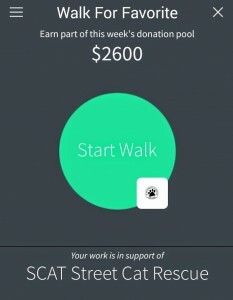 And they’re partnered with Detroit Dirt, a composting business, that I now recognize because of a Ford Commercial (check it out, it’s pretty brilliant.) Anyway, enough about philosophy and the stuff I love about them that’s related to everything but eating. Let’s get to breakfast. 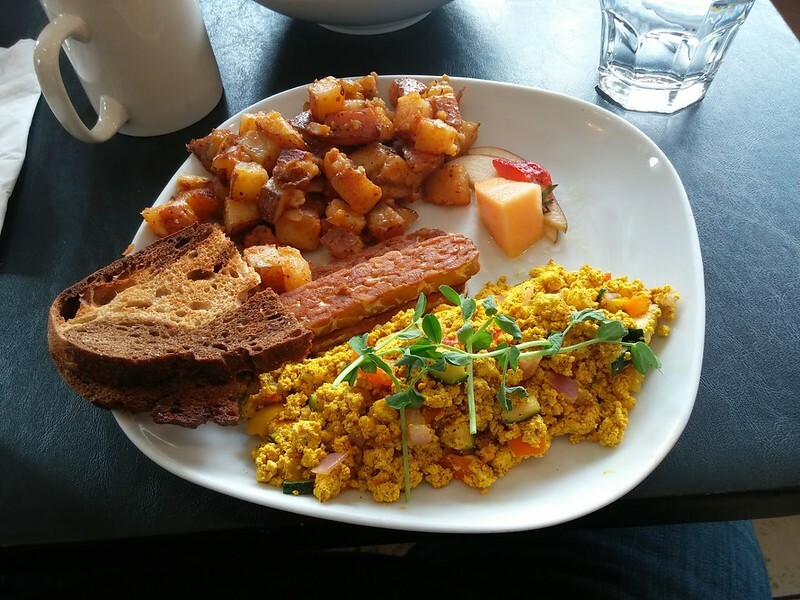 The various menus (breakfast, lunch, and brunch) are available on their website, and if you flip through them you’ll notice there is lots of options for vegans and non-vegans alike. We were both drawn in by The Vegan Breakfast, and the promise of Vegan Poutine on their Saturday/Sunday brunch menu. JC got the one with veggies (as you can see above), and I just got the regular one. It comes with a nicely cumin-y spiced tofu scramble, toast (we had the choice of sourdough, whole wheat, and marble rye – they come from Avalon Bakery, a spot we visited on a previous visit to Detroit) we both picked marble rye because that’s delicious (it comes oiled or margarined, we assumed it was Earth Balance or some non-dairy equivalent, but did not ask,) in-house marinated Michigan made tempeh, a bit of strawberry, apple, and a piece of my fruit nemesis: cantaloupe, and while we could have got our breakfast with a salad, we both opted for potatoes, which were fried up wonderfully, flavourful, and perfect for breakfast. 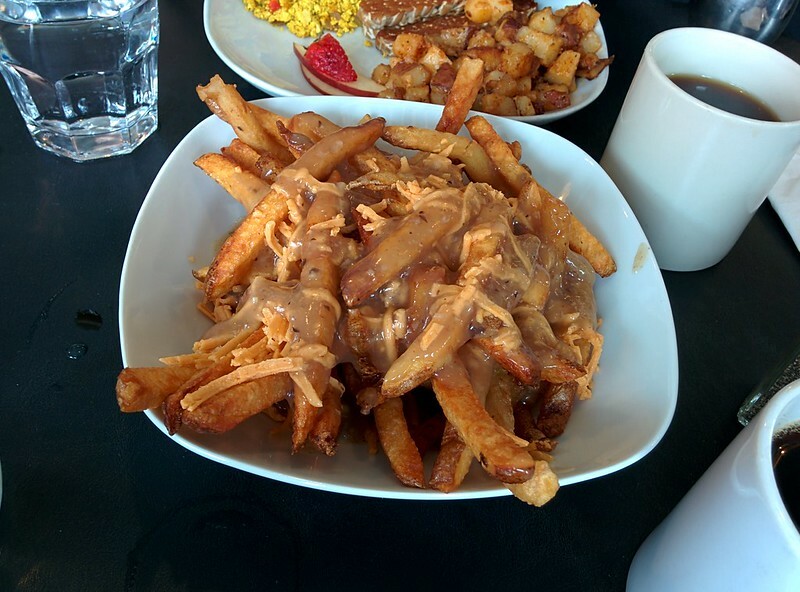 I think this would have been enough for me, but we ordered something mostly out of curiosity – the vegan poutine. Made with daiya and home-made mushroom gravy, and their hand cut fries. The problem, as you might notice if you’ve poutined before is that there was cheddar daiya on it. Who’s heard of a poutine with cheddar on it. No. Non even. But in reality it didn’t actually matter, because I’m neither a stickler for tradition, nor did I care as long as it was tasty (also it’s already vegan so challenging tradition in and of itself.) There also wasn’t an extremely obvious flavour difference because the mushroom gravy was like, bam I’m delicious, and the fries said pretty much the same thing. (I should stop talking to my food right?) I’d like to have those fries again, maybe with the mushroom gravy, skip the daiya. Overall, I liked Brooklyn Street Local, and I would go there again. They’ve got a nice atmosphere, everyone was friendly, and the coffee was bottomless (and, when we didn’t finish our cups of coffee – they offered to-go cups, probably from that aforementioned local cup company?) This was just all around a nice experience and a tasty one. 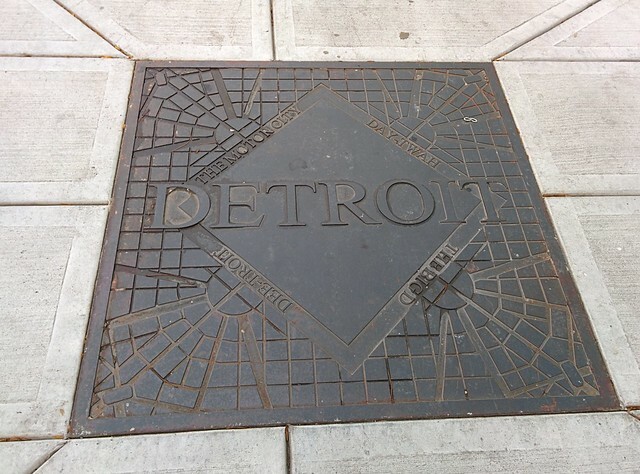 If you find yourself in Detroit, you should check them out too! Brooklyn Street Local, Michigan. Bookmark.